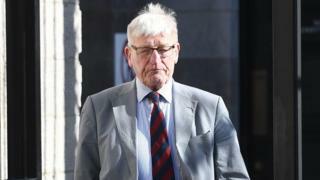 A former British soldier should stand trial for attempted grievous bodily harm with intent over the shooting dead of a man in 1974, a judge has ruled. However, Dennis Hutchings, who was a colour sergeant at the time, will not face an attempted murder trial. Mr Hutchings was the most senior soldier in a patrol which opened fire on John Pat Cunningham near the village of Benburb in June 1974. Although 27, Mr Cunningham had the mental age of a child aged six to 10. He also had an apparent fear of men in uniform: He ran away from the patrol and was shot in the back. Three shots were fired from Mr Hutchings' rifle, but it has never been proven that any of them killed, or even hit, Mr Cunningham. Mr Hutchings had potentially faced a charge of attempted murder, but the district judge ruled that a jury could not conclude beyond reasonable doubt that he was guilty and decided he should not go for trial on that count. He was arraigned on the charge of attempted GBH with intent to Belfast Crown Court on a date yet to be fixed.